Minty Mary Pea accepts payments by cash, or electronic funds transfer to our bank account. Bank account details are provided on the invoice. Delivery of hire items can be arranged if required, and for larger items requires a minimum item hire spend of $300. 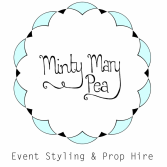 Minty Mary Pea will provide delivery cost in the quote provided based on item size and location of event venue. A damages bond of $100 or 50% of the total hire cost (whichever is greater) will be added to the balance of the final invoice. This bond will be returned to you within seven (7)days of the event, less any breakages, damages or professional cleaning. If any piece is damaged beyond repair, you will be charged two (2) times the hire cost of that particular piece. This bond will be refunded in full if there are no damaged or missing items. Should you wish to cancel your booking more than two (2) weeks in advance of your event, you will not be required to pay the balance of the final invoice, but will lose your 25% deposit. Should you wish to cancel your booking less than two (2) weeks in advance of your event (therefore having paid the balance of the final invoice); you will be eligible for a 75% refund of the balance of the final invoice, but will lose your 25% deposit. All backdrops, decor, furniture, lawn games, lighting, props, signage, and tableware remain the sole property of Minty Mary Pea and/or any hire company used by Minty Mary Pea. All furniture and equipment will be collected after your event. Any missing furniture, equipment or other property of Minty Mary Pea and/or any hire company used by Minty Mary Pea will be covered by the Damages Bond as described below.